May 31, 2018 – Hot off the newswire from the EAA: The EAA Founder’s Innovation Prize has added another highly regarded aviation expert to the lineup for the Tuesday night competition during EAA AirVenture Oshkosh 2018. Retired Lt. Col. Olga Custodio, the first female Hispanic fighter pilot in the United States will be the emcee, presenting the five finalists in the live showdown. The Founder’s Innovation Prize, presented by Airbus, is in its third year and challenges EAA members to share their best solutions for lowering the rate of in-flight loss-of-control accidents, the leading cause of fatal accidents in the general aviation community. Custodio retired from the U.S. Air Force Reserve with 24 years of service. 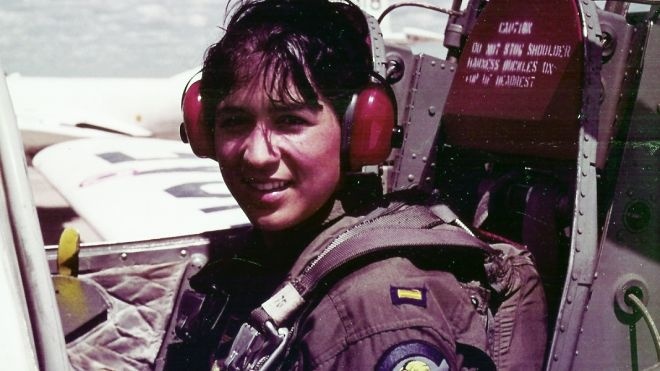 Among her countless achievements, she was the first Hispanic female to graduate from U.S. Air Force undergraduate pilot training, became the first female T-38 UPT (Undergraduate Pilot Training) flight instructor at Laughlin Air Force Base, and then became the first female T-38 pilot instructor training flight instructor at Randolph AFB. She was awarded the Air Force Air Education and Training Command’s Aviation Safety Award for superior airmanship during a bird strike and engine failure emergency and for executing a safe heavyweight landing in weather minimums. 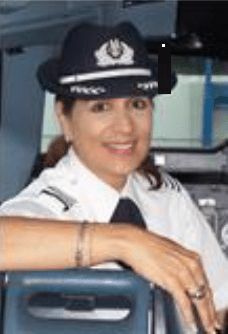 After resigning her U.S. Air Force commission, Custodio entered the Reserve as an officer training school instructor and began her 20-year career flying for American Airlines. She has logged more than 11,000 hours of flight time. See Custodio and the five Founder’s Innovation Prize finalists at An Evening with Innovators on Tuesday night July 24 at Theater in the Woods. Those who still wish to submit their idea for the competition must do so before 11:59 pm CT on Friday, June 1, for a chance to win one of three cash prizes. Visit www.EAA.org/prize to learn more. Below is a 7 minute long video is of an interview by FOX NEWS TV of Retired USAF and American Airlines Pilot, Olga Custodio. This entry was posted in AVIATION NEWS, HOT NEWS!, NEW VIDEOS and tagged 1st Hispanic Female Fighter Pilot in Air Force, 7 Minute Long Video, Air Force Air Education and Training Command’s Aviation Safety Award, Air Force Reserve, Airbus, American Airlines, bird strike, Charging Cheetas, Daedalians, EAA, EAA AirVenture 2018, Experimental Aircraft Association, FOX TV NEWS Interview, GA, Hot off EAA Newswired, Instructor Pilot, landing in weather minimums., Laughlin AFB Del Rio Texas, Leading Cause of Aviation Accidents in GA, Lieutenant Colonel Olga Custodio, Loss of control accidents in General Aviation, Married with two children, Oshkosh, Puerto Rico, Randolf Air Force Base San Antonio Texas, superior airmanship, T-38 Talon Jet Trainer, The Founder's Innovation Prize, Undergraduate Pilot Training, UPT, USAF on May 31, 2018 by FASFRIC.